The usual options we find easier to use is voice commands but speech recognition also has its own problems like its susceptibility towards noise. Voice commands are misinterpreted because of surrounding noise and besides talking to your watch in public does not make you look smart always. So in every way typing is a way more better option. It’s silent, not affected by noise and it’s the way we are used to. 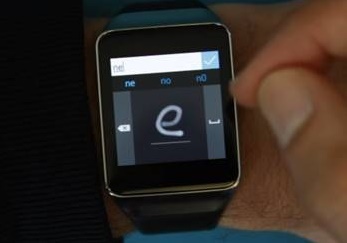 The video attached here shows the prototype for the Android™ Wear platform. This can be downloaded for research related works and the prototype works for both round and square shaped dials. According to the abstract provided by Microsoft, you can enter lowercase English letters, numbers, symbols but not uppercase letters. You must carefully write the letter so that prediction is performed rightly. Eyes free is an important feature to note. Special symbols like hastags should be inserted very minutely since they are not easily recognizable and are rarely used in sentences. Backspace key has a long-press function. the software suffers a number of limitations but since it’s in testing phase, some more improvements will be done in course of time.